Replies: 1 (Who? ), Viewed: 10687 times. 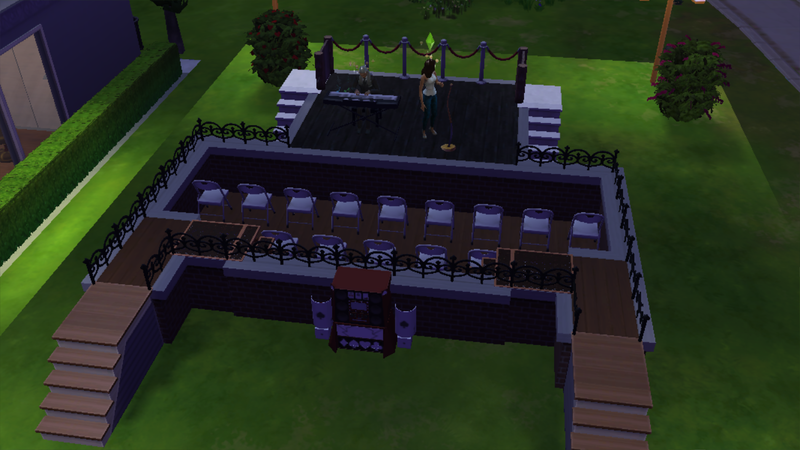 So I wanted to create an indoor stage for my Music Inclined Sims, however I discovered it wasn't possible. 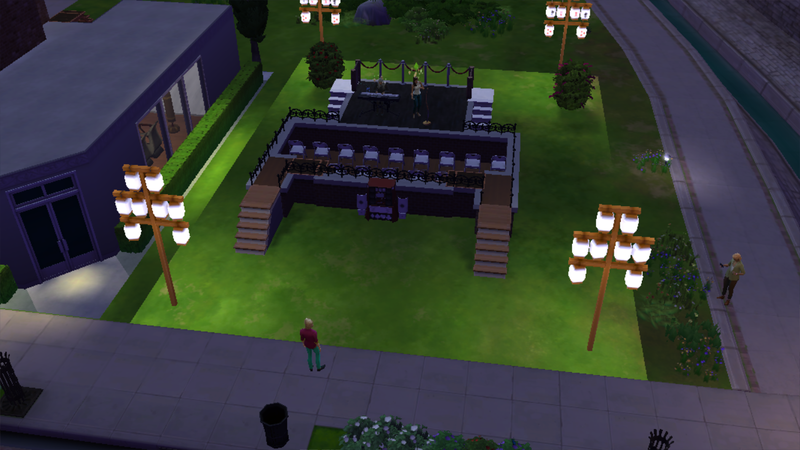 I could do it with 2 floors, however I know the watching Sims will end up on the same floor standing behind the musicians watching. I am creating a lot for the Entertainer turbo career. The Painter area will be in the basement. I ended up using the foundation to create the stage. I used the roped short half wall with a wooden gate in case I want to lock the doors to the stage I deleted the floor for the pit, covered the grass in hardwood, two sets of stairs (inside & out) and placed chairs. Excluding the "go here" bushes I stuck everything needed for a lounge in the basement for testing purposes. I loaded the lot and a NPC was onstage at the piano. I used an unplayed Sim to go sing a the Mic. Yeah, She sounded awful. I also tested that she could sit in the "pit", which she could. There was a Sim watching but he stood almost at the street cheering and clapping. I'm going to move the bar & stools from the basement into the pit which should drive Sims to sit there instead of standing way behind it. I recorded a video as well. Next I will test it for "go to work". I created the Astronaut-Athlete-Secret Agent multi lot which worked great although it showed the Athlete Sim I used with no job later and a fired moodlet. I had her get the same job and she did back at the same level. I guess that was a go to work custom career glitch. I will follow her to work again and see what happens! Has anyone discovered a way to create a stage, especially indoors? It's ages since I did this, but I made all the stages needed for the career for my Stranda world. I think you're mixing up the categories. If you have Showtime you can build a regular stage. The stage thing you use there is much simpler. You have a very small lot, I would have made it bigger.